The day which we have waited for long is finally arrived and christmas eve has begin. I wish everyone "A Merry Christmas And a Happy New Year"
This is the day of Lord Jesus and we celebrate it with lot of fun and happiness. Festivals are always incomplete with sweets and also there is no fun when the sweets are missed out during any festivals .So here are some special assorted cupcakes decorated it with home made buttercream frosting. These cupcakes can be hit to any special parties and also can be wrapped them as gifts to your loved ones. Hope you all will like them. 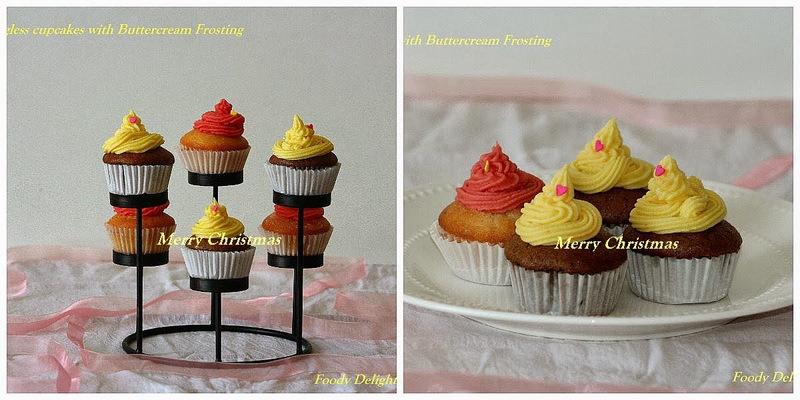 So try out these cupcakes on this christmas and share them with your friends and families. Sieve all the dry ingredients together.Keep it aside for later use. In the wide bowl, add all the wet ingredients and whisk well till all the ingredients are well combined into smooth paste. Now add all the sieved dry ingredients and fold well into the wet ingredients. Divide the cupcakes batter into two portion. Keep one portion as it is. This will be the vanilla cupcakes and other portion we need to add the chocolate flavour to make them the chocolate flavoured cupcakes. So melt the chocolate chips into microwave for 15 seconds. Stir it and make it a smooth chocolate paste. Add sieved cocoa powder and melted chocolate into the second portion of cupcake batter. Mix well and the chocolate cupcake batter is ready. Line the cupcakes moulds with cupcakes liner. Scoop out both the flavoured cupcakes batter into the cupcakes liner. Place the cupcake tray into the oven and bake the cupcakes for about 30 minutes. Or check the cupcakes by inserting the toothpick at the center of the cupcakes. If the pick comes out clean, then cupcakes are ready to come out of the oven. Take the tray out.Cool the cupcakes completely to room temperature. For Preparing The Buttercream Frosting. Beat the softened butter to smooth paste using hand whisk. Keep on adding the icing sugar in batches till you get the nice thick consistency of frosting cream. Also add vanilla essence to the frosting and mix it well. Now divide the frosting in two portions. And add the colours in both the batches. If you do not like the colour, you can skip it out. When the cupcakes are fully cooled, Pipe out the frosting on each cupcakes and decorate it with your choice. Here we go assorted cupcakes are ready to serve. Pick the one you like it.